In a game that is continually embroiled in debacle after debacle, this season has been particularly scandalous in terms of off field incidents. In any other year the story of Matt Bowen retiring would have gotten far more traction – particularly with the winning streak that the Cowboys have gone on to see them reach the finals in spite of an extremely lackluster season. Bowen is a player who is always remembered fondly by Rugby League fans. He has a cheeky grin, a wicked turn of pace and is one of the few remaining “One Club” men in the sport. He has become synonymous with the Cowboys and rightly so – he’s been at the heart of just about every success that they’ve had. But someone said the following words to me in regards to Matt Bowen last week – One of the best #1s of the past 10-15 years and could’ve reached even loftier heights if it weren’t for all those injuries. – and as fond as I am of him as a player, I’m not really sure I can agree. That is to say, he could be up there, but I’d need to think about it and it’s by no means a certainty. Firstly we’ll have to get a rough definition of ‘One of the best’. There are a few things to consider here. To make it easier, I’ll call the ‘10-15 year’ time period as this millennium. So from 2000 onward. Now, to be ‘one of the best’ at something over a period of 100 years, I think it would be fair to have a list of about 30. So for a period of 13 years, I think I can be generous and give you about a top 3 or 4 to be classified as ‘one of the best’. Secondly, we have to consider the position we are talking about. I mean if you were to say ‘one of the best wingers’ there are twice as many wingers on a field as there are full backs. One of the best back rowers would mean there is three times the amount. In those instances I’d be happy with a top 7 or 10 respectively. But alas, we are talking about fullbacks, and there can be only one. So I guess the only way to definitively do this, is to go through each of the other candidates and compare them to Bowen, starting from 2000, but first for a little clarity in comparison, a brief run down on Matt Bowen’s achievements in his career so far. I’m going to have to set The Lockyer Rule in place before we go forward. That is, to make a fair comparison, I’m only going to compare what a player did while playing as a fullback. Remarkably, Darren Lockyer played the exact same number of NRL games as a fullback as he did playing at five-eighth (166 each) and considering the number of names I need to get through in my comparison, I’m not going to waste any further time on Lockyer. He was easily a better fullback than Bowen (no slight on Bowen by any means) and there’s no real argument to be had here. Lockey is a knockout winner here. Not a good start for Matty, already one spot gone in the final Six. Second player, second rule. The O’Davis Rule states that I’m not going to try not to consider any players achievements before 2000 when making the final call, but they do need to be used to contextualise a players greatness overall. Robbie O’Davis played 11 matches for Queensland, represented the Kangaroos on 7 occasions and won a Clive Churchill Medal all before the turn of the century. If those things had happened post 2000, I’d have to put him ahead of Bowen as well. However comparing only his achievements since we moved into this millennium creates a different match up. 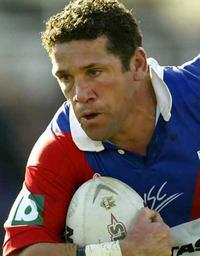 Robbie played one more Origin match (in 2002) where he was picked as a winger. He had 2 finals campaigns in 5 seasons including winning a second competition in 2001 – and he was a major part of that – something Bowen has not achieved yet*. Based on those statistics alone Bowen wins the match up fairly comfortably. But in truth I think this is a much closer match up, even just from 2000 onwards. Robbie’s major achievements were mostly behind him, but he was still a great player who was feared and respected by oppositions throughout the league**. I think O’Davis, over the course of his career, was a better player than Bowen and will ultimately be ranked above him in the history of the games fullbacks, but that’s not what’s being judged here. I’m going to have to give this one to Bowen, but on a much closer margin than you’d expect. That’s what makes it the O’Davis Rule. The O’Davis Rule is the only reason Brasher gets a mention here. He was well past his prime by the time 2000 hit, but he did have massive career achievements prior to that. 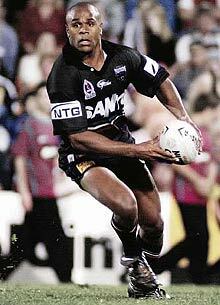 Another who was a better fullback than Bowen, just not really in this era. 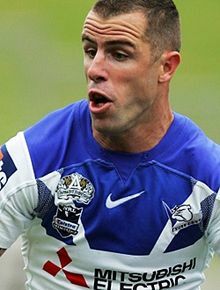 Here is a player that has often fallen into a very similar category to Matt Bowen. Try scoring, good ball handling skills, considered under-rated, never won a Grand Final, the list goes on. Over their careers, I think they make an interesting comparison. But Peachey is another one to fall victim to the O’Davis rule a little bit here. He was named the Dally M Fullback of the year in consecutive years, which is something that only one other player (Darren Lockyer) has done in the last 20 years. Unfortunately for David, those years were 1999 and 2000, making one of them ineligible for this comparison. On top of that Peach had representative honours in 1997 (albeit in the Super League) which are again ineligible. 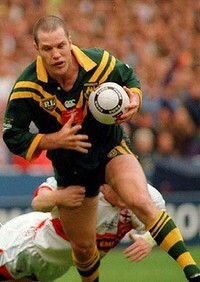 His one real Origin cap came in 2000 and he scored the winning try, but further rep jerseys always seemed to elude him. He had a wonderful career, and on the balance should probably be about on par with Bowen, but for this comparison he falls behind in a points decision. This is an interesting one for a couple of reasons. On the surface it may seem like a win for Bowen, but you need to look a little closer. People seem to forget about Hodgson a little because he’s played the last 5 years in England (and will still be playing next season at 36 years old!) But he was and is a great player. He’s getting the advantage of the reverse O’Davis Rule, in that he played his first three seasons before the time period we are assessing, but he didn’t achieve anything, so it has the effect of wiping his slate clean from those awful seasons with the Magpies. Hodgson played 6 games for NSW, starting all of them at fullback (Bowen may have racked up 10 Origins for Qld, but he only actually started two of them at fullback, the rest he came off the bench). It’s a shame that he is remembered at this level mostly for being rag dolled by Gorden Tallis as he was a far better player than that***. 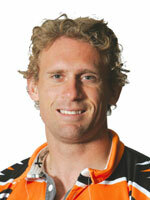 He played in a losing Grand Final side for Parramatta in 2001 where he scored 2 tries. He was the league’s leading point scorer in 2005 while winning the competition with the Tigers, as they just so happened to knock out Matty Bowen and the Cowboys**** from their only Grand Final Appearance. He was voted the Dally M Fullback of the Year that season too. His NRL try scoring ratio is not far below Bowen’s, plus he is a goal kicker which is an added dimension to his game. They have similar career win ratios and if I was to stop only at Hodgson’s NRL career, they stack up fairly evenly. But that would do a disservice to him. In 2009 he joined Huddersfield in the English Super League. Not a marquee team by any means, but in just his first season in the ESL, he won the “Man Of Steel” Award as the competition’s best player. Admittedly it is not as strong of a competition as the NRL, but to be named the best player in the league is an achievement that has no comparison to anything in Bowen’s career. In addition to this, he won the Challenge Cup in 2012 with Warrington where he received the Lance Todd Trophy for the Man of the Match in the final. He also went on to captain the “Exiles” team against the England Origin side just this year where he led the team to a 32-20 victory to retain the shield – oh that’s right, he also scored 2 tries and kicked 4 goals in the match to score half of the team’s points. So let’s say that you think the ESL is a second rate league, and those achievements, both individual and team, need to be downgraded. Even then you would have to think that they topple him over just enough from what I considered a stalemate at the end of Hodgson’s NRL career to give him the win, right? I’m afraid for poor Matty Bowen’s sake, I’m going to have to give this one to Hodgson, with a caveat that if the Cowboys can win the competition this year, that leapfrogs’ Bowen because it was just be such an immense achievement. So as we stand, there’s 2 spots gone, 4 left. Invoking the Lockyer Rule, I have to wipe the first 3 years of his career (2000-02) where he played as a full time winger. This takes away a Grand Final loss and a Grand Final win. Additionally, the O’Davis rule means that I’m forced to scrap the highly prestigious international cap that he got with Italy in 1999^. However, even with those things set aside, he’s had a fairly remarkable career. 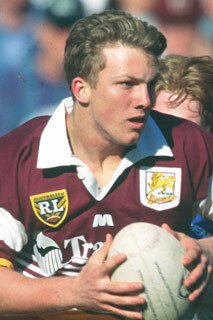 He started 11 Origin matches at Fullback for NSW with 8 tries. 19 tests for Australia where he scored 11 tries. Three Grand Finals (for 3 losses, but still) in 2003, 2004 and 2010. 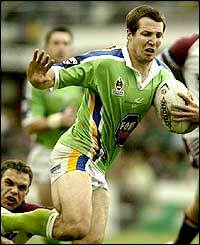 Dally M Fullback of the Year in 2004. Golden Boot Winner in 2005 for the best player in the world 2 time winner of the Harry Sunderland Medal for the best Australian International… I’m invoking the mercy rule for poor Bowen here and we have our third entry above him. 2 Origin games, a Dally M Fullback of the Year award (2006) followed by a switch to Rugby and a comeback in the ESL a few years later. No real comparison, even at his best, he wasn’t the player that Bowen was on an average day, but was still a solid fullback that spent a good chunk of his career with the thankless task of leading the Raiders to the first week of the finals. One more in the win column for Bowen with an early round knockout. The classic example of a player who was an automatic selection in City v Country, but never a real consideration for NSW Origin^^, The General was a better fullback than he gets credit for. He wasn’t the flashy player that some if his peers here were, but he was far more reliable and consistent than a lot of others. He won a Grand Final in 2004 (and lost one in 99, but O’Davis rule etc) and he played a lot of finals football. In fact, he interestingly never got knocked out of the finals in week one for any team he ever played in. Because of his style he didn’t receive many individual accolades or rep jerseys higher than mentioned above. The closest he got was being the 18th Man for NSW in 2009 and frankly that doesn’t stack up well enough against Bowen. Patten wouldn’t lose you a game with a risky play but he was unlikely to win as many for you either. KO Victory to Bowen. I remember at one point of my life/his career I was adamant that Rhys Wesser was the worst first grade fullback in the competition. This would have been around the 2000-01 area. He was wildly error prone, a liability defensively and nowhere near good enough in attack to make up for it. I still think that I was right back then. At the very least I wasn’t far off. Then, all of a sudden a ridiculous explosion of form saw him ride a wave that basically made the rest of his career. A vast improvement in 2002 saw him score 19 tries in 22 matches, followed by the dream season of 2003 where he scored 25 tries in 26 games on the way to an NRL title with the underdog Panthers. This parlayed into a starting berth at fullback for all 3 Origin matches in 2004 and the Panthers fell one game short of back to back Grand Finals. 2005 was a disappointment for all parties, but a return to try scoring form saw Rhys Lightning get a call up for what would be his final Origin match in 2006. Unfortunately, he reverted to his pre-2002 form after this and the window into the sometimes genius play of Rhys Wesser was closed forever. Sure you would see occasional glimpses of what he was once capable of, but they were fleeting. At his best Wesser was as good as, if not better than Bowen, but at his worst, he was far, far worse. This one is a comfortable point’s decision for Matty. So with 9 players down and 10 to go, we have Darren Lockyer, Brett Hodgson, and Anthony Minichiello taking up half of the final 6 spots. With 10 more players up against Bowen for the final 3 spots, it could be a tough fight for him to make it! *I know it’s a stretch, but the Cowboys are the form team of the competition leading into the finals series. **Not necessarily respected as a man so much after the drug suspension, but he was someone you had to respect on the field or you’d pay the price. That sort of respect. ***Not to mention that the tackle should have been stopped well before he was taken over the sideline, when he was actually held. Would definitely be called correctly these days. ****Clearly the name of the band that Bowen will be starting in his retirement. Expect a residency at the Railway Hotel in Cairns this summer. *****The 3rd “i” in his name is redundant and I don’t like it. That is all. ^But not the 3 he got in 2011 with an 86 point win against Russia, 46 point win against Serbia and a draw with Lebanon. I love fringe nation internationals. ^^Other players on this list include Glenn Morrison, Amos Roberts, Mark Minichiello and a good chunk of Tigers players over the last 5-10 years.